A few days ago, I set as my primary goal for 2016 to have more mindful, meaningful conversations. Now it's time to think through exactly how I am going to operationalize that goal and integrate it into my personal learning plan (PLP), especially in light of all the other things I am planning to do. 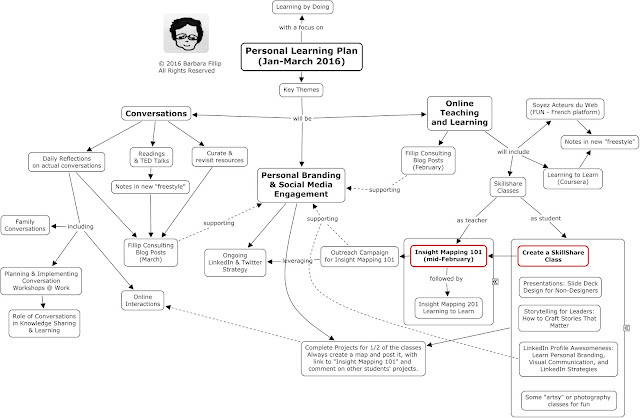 I don't create personal learning plans on a regular basis but when I do I find the exercise quite useful as long as I keep the timeframe relatively short. My interests will inevitably shift. Three months is a good timeframe for me to focus on a few specific themes. The themes for January to March 2016 will be: Conversations, Online Learning and Teaching, and Personal Branding and Social Media Engagement. Click on the map to enlarge and view in a new window. Two things to note on the map: 1) The biggest effort will be put into producing my first Skillshare class, which is the best example of how I plan on learning by doing. I'm very much in a mood to "just do it! "; 2) As is often the case, the mapping process allowed me to identify connections across all three themes, which makes this plan very coherent (at least in my own head) and ensures that no element will be isolated and ignored. 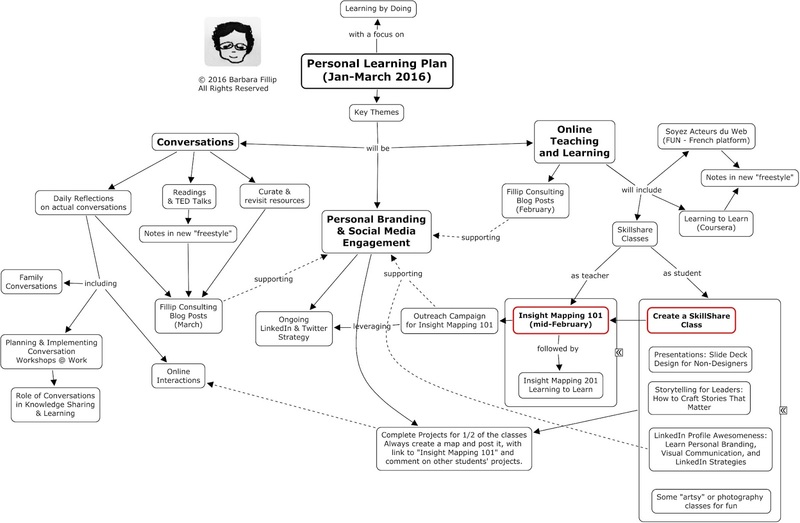 Looking up an old Personal Learning Plan from 2009, I realized how my thinking has evolved and how my mapping has evolved as well. Nice work Barbara and inspirational as well! I agree that holding to your definition of learning is the right way to go. People often sluff off the important distinctions in a word and say "oh, that's the same thing". Better to go with your meaning than the meaning held by those that want you to follow their path.